Mornings preparation area, lots of room, if organized! 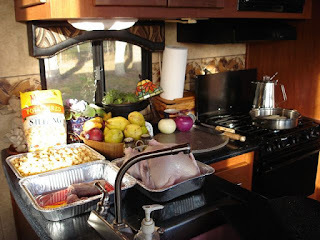 Cooking a full-fledged dinner in an RV can be a daunting task, the Suzie Homemaker "Toy" sized oven and lack of counter space makes even the simplest multi-course menu a challenge, but I'm here to say it can be done successfully if a few basic pointers are kept in mind. Organization and pre planning is the key, also timing and preparation of various dishes must be scheduled for a successful presentation at the proper time. When planning the menu, try to keep it simple, trying to prepare a dozen dishes can lead to a less than successful result for all of them. Stick with just a few favorite dishes that you know well and concentrate your efforts on getting them cooked well and nicely presented. Today our focus is on Turkey with homemade stuffing, sweet potatoes, mashed potatoes and gravy, green bean casarole. There are other side dishes, but most are bought or prepared at another time. 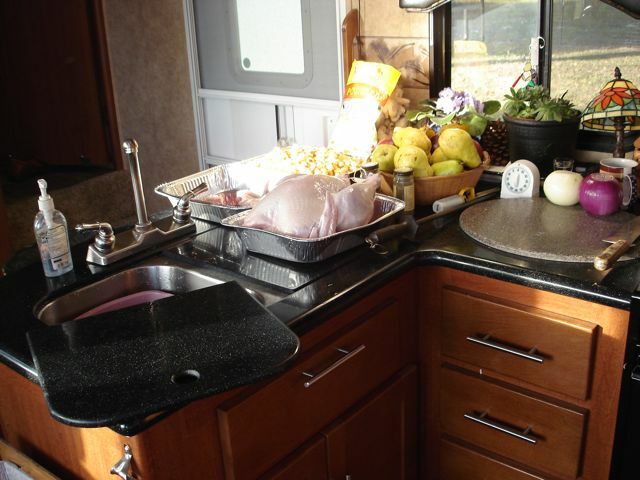 Our focus today is on the actual main dishes we will be preparing using the stove top, microwave and oven supplied by the manufacturer. In order of preparation, the bird comes first. Bought frozen, I first thawed partially in my nice deep stainless sinks buy submerging the wrapped bird in cold water for several hours one day before preparation, then finishing the process by placing it in the refridgerator overnight. 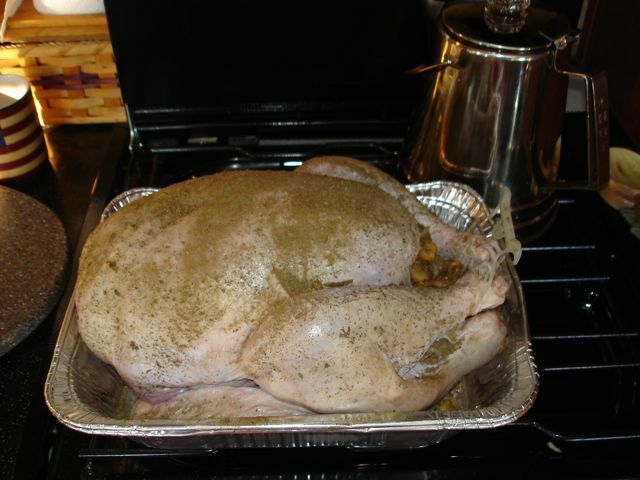 The next morning I washed and lightly salted the cavity of the bird while onions and giblets sauteed in a 1/2 cup butter on the stove top. 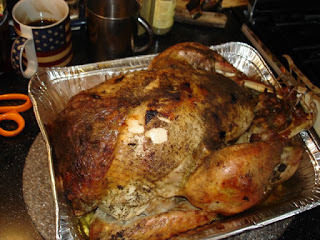 Our 11 pound turkey, bigger is not advised! 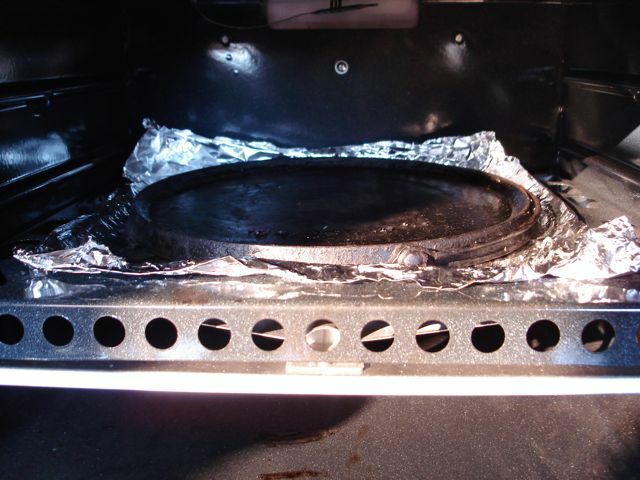 For the best roasting results I used a aluminum steam table pan, (12X10X2.5 approximatley). These pans are invalueble since they fit nicely inside the oven. I used two pans nested under the bird and one inverted on top of it. 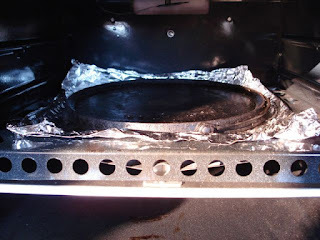 Inside the oven it is recommended you buy an Oven Stone to regulate the heat and keep the bottom of your food from burning, I couldn't find, nor afford one, so I used and old flat round griddle in it's place. 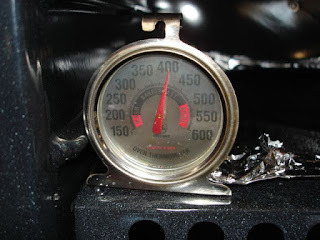 (Always heat up the oven when you first put in the griddle with the doors, windows and vents open, it's going to smoke at first). 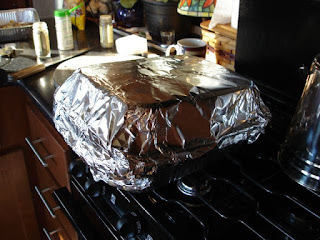 After stuffing the turkey it was placed in the pan(s) and wrapped with an additional covering of foil to seal it up. I placed it on top of the griddle, (the oven shelf being removed), and baked for 5 hours altogether. Three hours into cooking I removed the bird and poured off the collected liquid in the bottom of the pan to be used for gravy, it also helps the bird cook faster and better when the liquid is removed during cooking. After removal I used the oven, (with shelf in place), to bake the sweet potatoes, baked green beans and extra pan of stuffing for one hour. 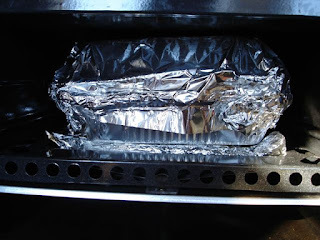 The turkey stayed in it's foil bundle during this time to even out the heat and making it even more tender. 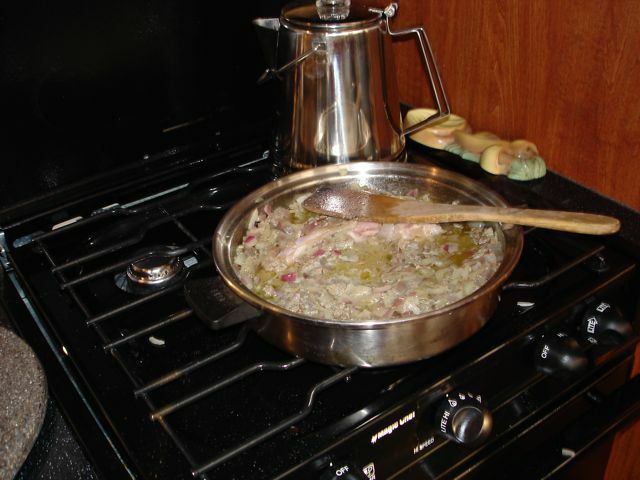 Mashed potatoes were boiled on stove top with jackets on and sauteed garlic cloves stirred in while mashing. 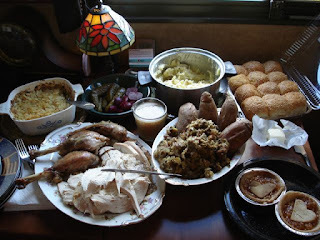 Gravy was made by boiling the drained off turkey juices in a pot on the stove top. Two tablespoons of flour whisked into a cup of cold water is stirred into the boiling drippings and boiled for several minutes more until thickened. Sweet potatoes were precooked in microwave for 8 minutes to soften them up to insure they were done before baking in oven wrapped in foil. 400 degrees for 5 hours does the trick! Perfect white sauce was made for the french green bean casarole by melting 2 tablespoons of butter, stirring in 2 tablespoons flour and heating in microwave until thick,(about two minutes), then stirring in 1 cup milk and heating again for about 6 minutes, stirring in between. If you could never make perfect white sauce before on the stove top, try it in the microwave, it never fails! The result's are shown here, a good bird done well! 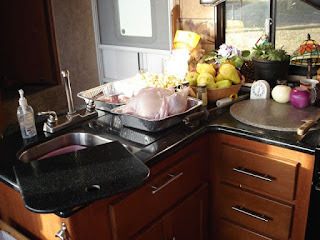 Other points to keep in mind are that you should have as many doors and windows open to facilitate cooking odor venting, (it will drive the neighbors CRAZY! ), as well as your oven and Fantastic Fan on continually. Do your dishes as the they come up, saving space for preparation and saving the dreaded chore from having to be done after dinner! All in all, my dinner was an unqualified success! The entire spread served buffet style, mix of fancy china an stainless.. Thanks for the post. The food looks delicious and you made it sound easy! Thank you for the turkey tutorial. 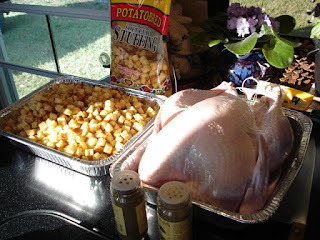 In the past we have used a table top roaster oven to cook our turkey, but it is not the same as being roasted. This year we used the RV oven following your steps and it came out perfect! Thanks! How much propane was used? We have 2 7-gallon tanks just want to ensure we have enough.